Motormouth … disciplined in Port Dickson?! Back from Port Dickson yesterday. A short 3 days 2 nights vacation …. not. It was another course to instill those integrity/morale values/team building kinda thingie. You know, when one’s chomping his face off every corner he goes, while working some more, one REALLY is in dire need of some discipline. Or spanking. Unabashedly, I’ll admit that it’s my first visit to Port Dickson. Yup, throughout the 70 years of my life. Bearing in mind the beach ain’t that worthy compared to cleaner ones out there, (or maybe, everywhere?) I did not even bother bringing a swim trunk nor any beachwear. 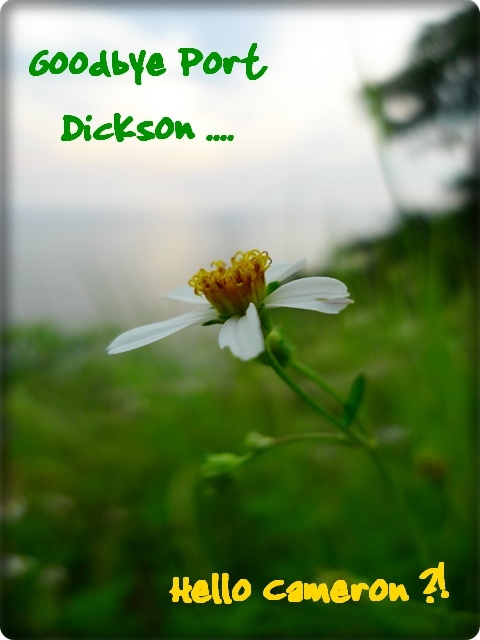 For which I did not regret, as the low tide revealed all the ….. scums, litters, and dirt underneath the murky waters. A 3 bedroom apartment with breakfasts – FOC. Muahaha …. Locating this resort ain’t a daunting task, given the almost end-of-the-world location. 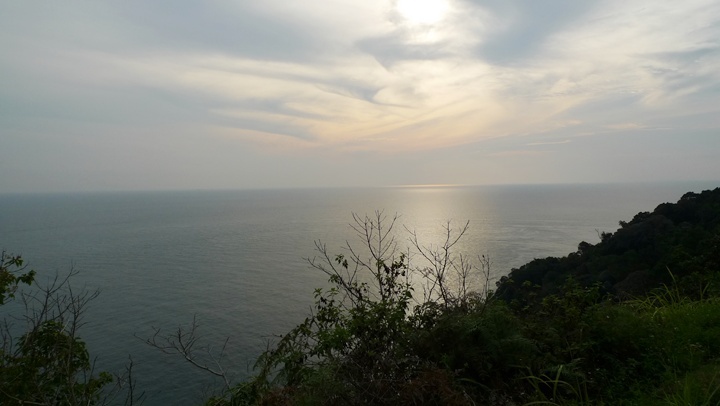 Or rather, the very end of Cape Rachado (‘Broken Cape’), or Tanjung Tuan. 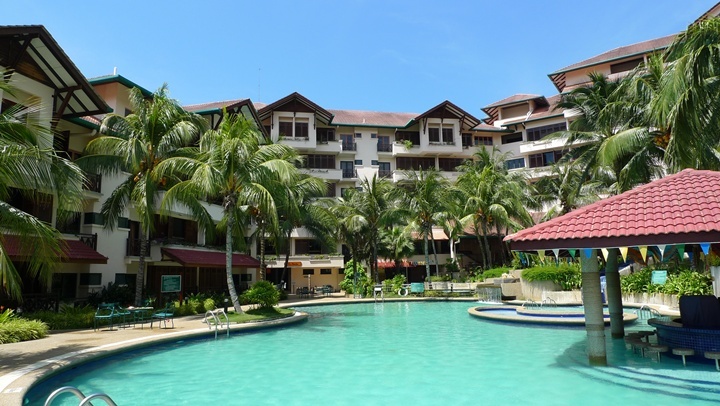 The resort is about 18km away from Port Dickson town, hence if you’re loving the isolated, far from civilization type of getaway, this may be just the place for you. They have apartments with 2, 3 or 4 bedrooms. Rates from about RM290 onwards for the 2 rooms unit, our 3-rooms apartment came with 3 double rooms with air-cond, 3 bathrooms, a living room, basic kitchen amenities (though you’re NOT allowed to cook), and a TV set in the hall, with cable channels (though rather limited options). The buffet spread. With Negri Sembilan’s Minangkabau style Malay cuisine, mostly. A compulsory ‘Masak Lemak Cili Api’ dish is served at every meal! 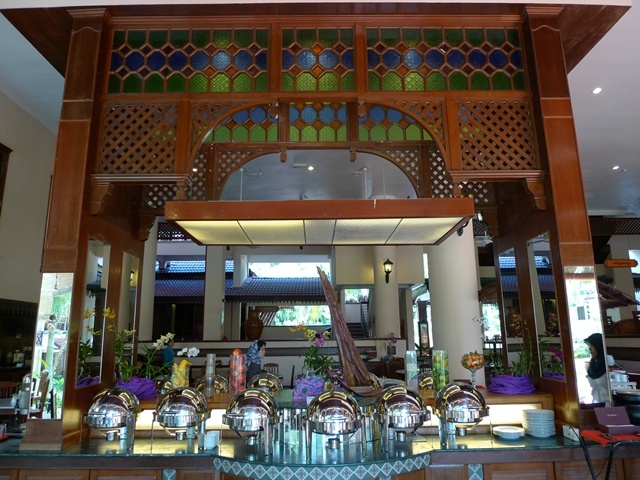 Since we’re more or less constrained in the resort for a good 12 hours or more per day, we dined in at the cafeteria (food’s included in OUR package, therefore why not?) most of the time. Selection of dishes may not be aplenty, with about 2 meats and 2 vege at most, but their Masak Lemak Cili Api (a richer curry dish with lots of santan/coconut milk, but fuelled by lots of spicy chillies/bird’ eye chillies, hence the moniker Cili Api). Recreational activities include hiking to the hill atop Cape Rachado. 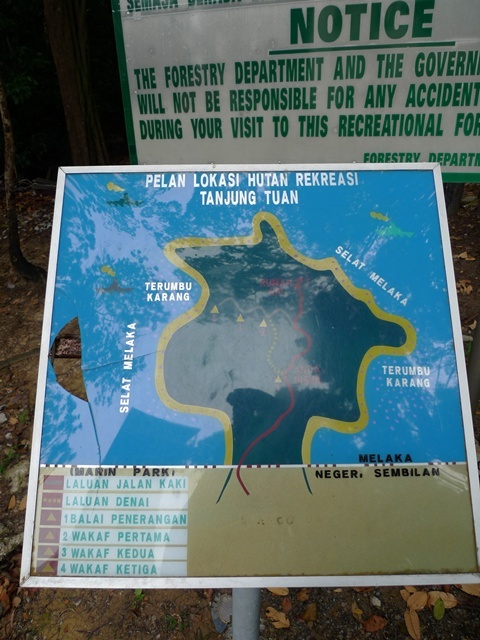 Legendary folklore spoke of the famous Malay warrior of the 15th century, Hang Tuah acquired his strength and knowledge by meditating at Cape Rachado. The legend further claims that his footprint, which was left embedded in a boulder, is visible to this day. (Taken from PNB’s website). But of course, mythical stories conjured up may be misleading,for I’m damn sure whatever footprint that was left has been washed away, IF there ever was this footprint in the first place. Anyway, who doesn’t like mysteries, myths and deceits? Hehe …. The posers. And the lighthouse, which was gated by the way. 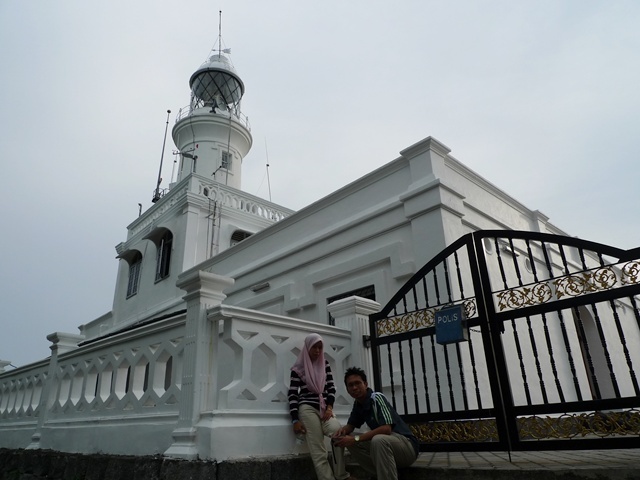 The climb to the top, the gated area, and the lighthouse with a MEASAT satellite! 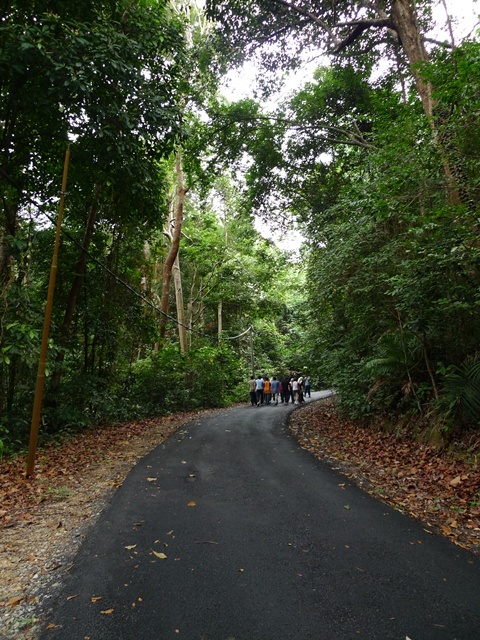 The area around Cape Rachado – Popular with hikers, as well as bird-watchers. But the place closes at 7pm daily, hence do not push your luck! Free entrance, by the way. View atop the hill. Nothing spectacular, and the climb was nothing either. Mere steep slopes, and lotsa mosquitoes! Enough with the curries, we ventured out slightly, to a seafood restaurant along Telok Kemang, about 5-10 minutes drive from our resort. 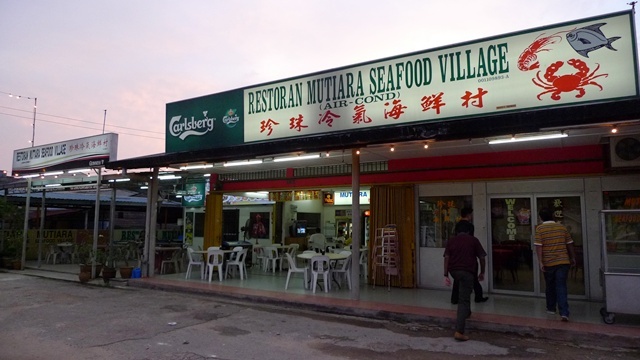 Mutiara Seafood Village has even been reviewed by Bangsar-Babe before, and seemingly a reasonable and excellent choice for seafood, amongst the restaurants along Jalan Pantai. They have a one page menu, bilingual, hence no sweat if you’re at lost on what to order. But the staff there were rather accomodating with their recommendations on what’s fresh and what’s not so, as well as their signature dishes. Topping the list of must try is the Butter Prawns, or Nai Yau Har, with sinfully rich gravy so addictive, you’ll be sipping, drinking, drenching your rice with it, and walloped off the whole serving in no time. Seriously, lip-smacking stuff. The prawns were not of the largest variety, anywhere between M-L sizes at most. 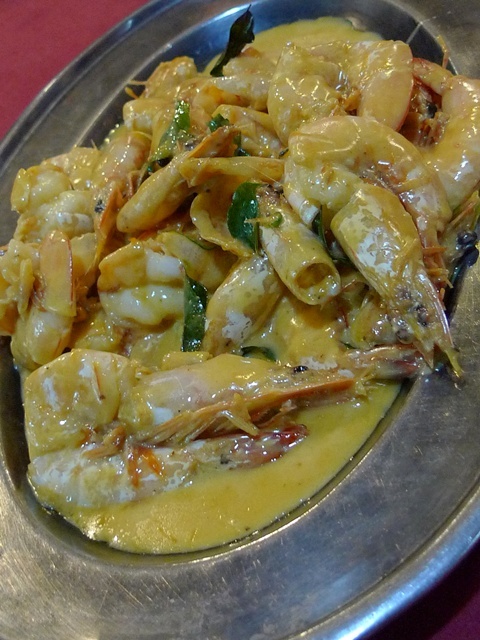 Other noteworthy dishes include the Kung Pou Lai Liew Har, or Heh Koh, or Mantis Prawns. At Mutiara’s, the mantis prawns were crunchy til the last bite, glistening from the dark, sweet and slightly spicy sauce, with the usual spring onions, onions and dried chillies. The clams (La-La) were a bit off, but thankfully we ordered the Kam Heong version to mask the slight fishy taste, indication of not so fresh supplies. The deep-fried squids was disappointing though, with very thick batter, overwhelming the thin slices of squids beneath. The fish can be cooked in a variety of ways. 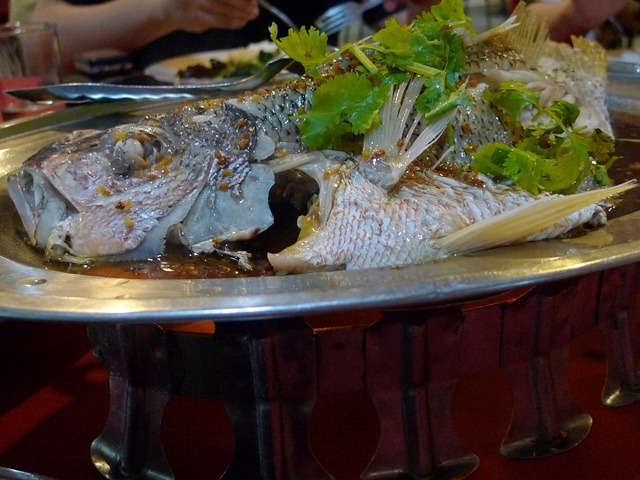 One very novel way of cooking their fish is the depp-fried fish with lotus leaf, or something like that. But fresh fish should NOT be fried, or so I was told all this while. Hence we opted for the plain, soy sauce steamed red snapper, or grouper, based on the lady boss’ recommendation for fish of the day. Indeed, the flesh was firm, and tender, with not a hint of unpleasant stale/fishy taste. Needless to say, this was polished off to the bones. The meal came to RM170 for the 7 of us, with the fish and prawns priced at RM45 each. Other dishes came in LARGE portions, priced at about RM12 – RM18 each. Rather reasonable, except for the prawns, but given the fact that the Butter gravy was literally; To Die For, the dinner was an overall satisfying one. Location : Mutiara Seafood Village @ Lot 90-E, Batu 7, Jalan Pantai, Telok Kemang, Sirusa, 71050 Port Dickson, Negri Sembilan. Tel No : +606-662 8928. Wow, you really travel a lot. 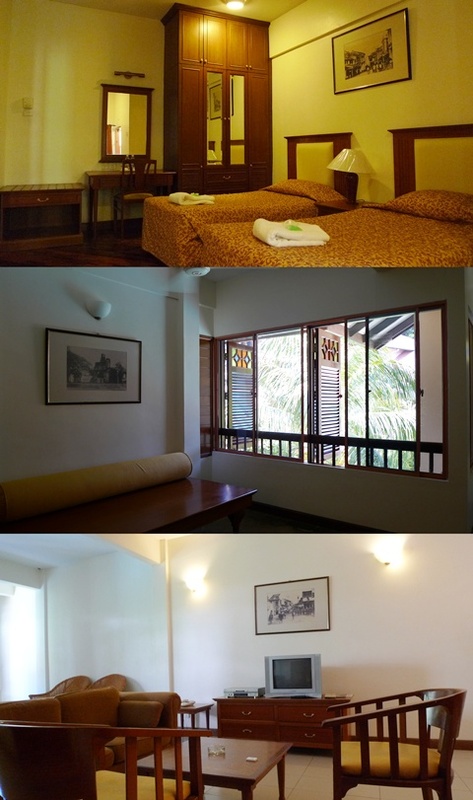 Nice photos of the environment of the hotels. Going to Cameron next? Have a nice trip. yeah, tomorrow will be departing. let's hope the weather's cool enough, a getaway from the heat in lowlands. ehhh..whr is the N9 food?? thenomadGourmand : hehe, I didnt even bother to snap at all themeals. lazy eh? cz room is a bit far from the cafeteria, and I dont wanna carry my camera to the talks. J2Kfm? Hot travel and cool pics. Wow, the resort is so nice and comfortable! the food was quite expensive huh? Yeah why no pictures on beach? Anyways, becareful of those monkeys, they carry herpes!! 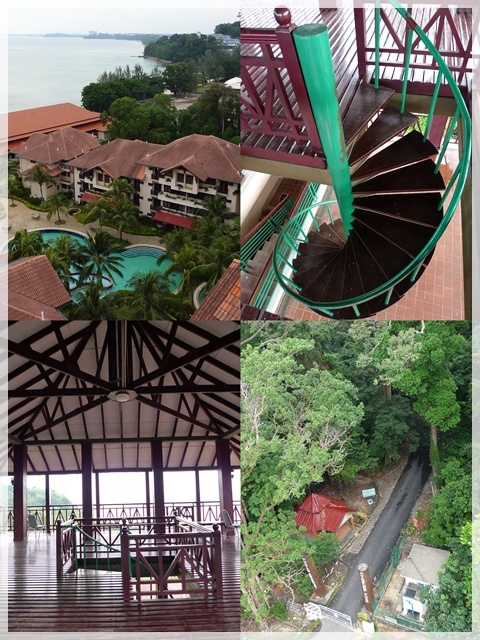 Wah, i wouldnt mind this place for my teambuilding.. would have loved to rrrrun up to the light house! PD brings back plenty of memories for some of us, like the Golf Club, the awful seminars,the dirty beaches , bad mosquitoes in Blue Lagoon and the generally lack lustre restaurants/food , and the unripe durians ! HAHAH, the resort looks quite nice, but as i've discovered, in msia, resorts actually look nicer in pics than real life almost inevitably. PD not that bad la, for us KL lites with no nearer alternative. 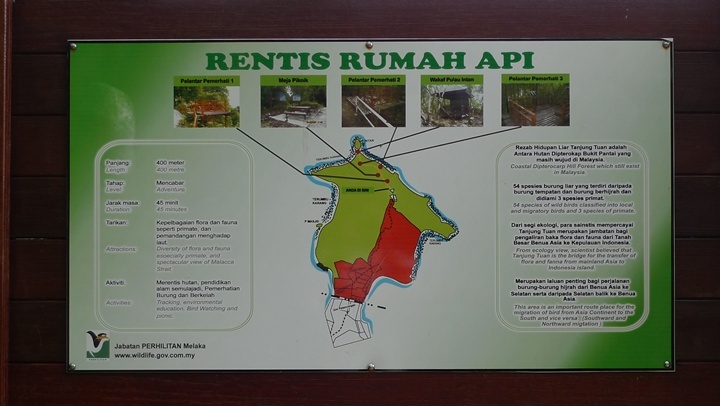 at least in ipoh u have lumut, pangkor etc. very hectic schedule, huh?? hope you enjoy in the highland. The view from the top of the hill not spectacular? I find it awesome! 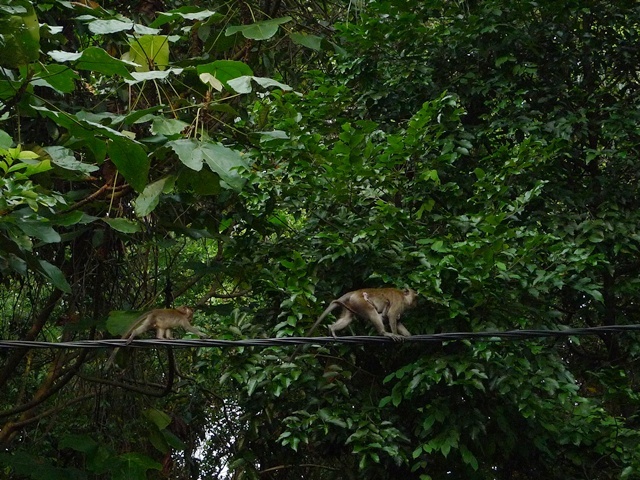 The macaque there can be frightening but the view is worth it. So far the food is so so in PD. jencooks : initially, we thought the baby bat was dead. but clearly, it wasnt. 550ml jar of faith : masak lemak oklah, spicier than the versions up north. no pics, as I did not carry my camera around much. kevin chung : the resort was OK, beautifully designed to fit the motives. seafood was OK, not really expensive, given the tourist-y spot of Jln Pantai. Wilson : yup, din bother snapping. but probably cz our stretch of the beach was not upkept. Cumi & Ciki : you probably should run. we strolled, and the mosquitoes were relentless!!! those not turd lah, I think. but damn huge beetle/roach thingie. FBB : true! I've been deceived countless times, resort/hotel-wise. NKOTB : thanks, I did enjoy myself, it was relaxing. iamthewitch : FAT is small matter. taste is everything …. well, least not in every meal. worldwindows : but they seemed dormant enough the other day. 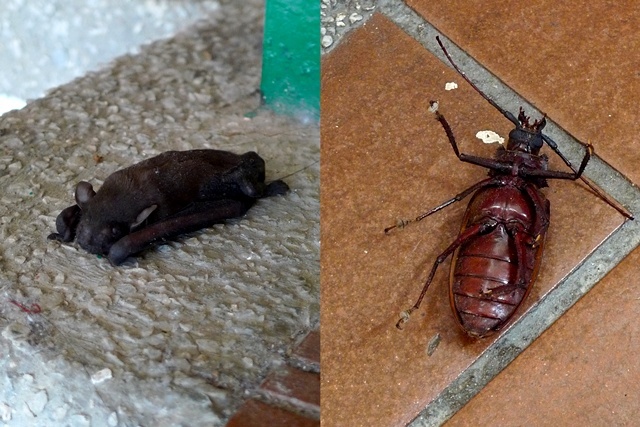 Guess the beetle next to play dead bat can represent the joker! Dead too but alive ! oh yea..next time u or ur frenz want to go PD, let me know.. Okay, thanks erm .. legend? So if I say I am from this blog, do I get MORE discount then? but I’m still new to everything. Do you have any tips for rookie blog writers?